Hi everyone, we will be submitting a patch in the near future that adds Windows/ARM32 support to GO. All but a few tests are passing, and this implementation has been used to compile GO itself and run Docker containers on Windows/ARM32. We look forward to working with the community to iron out the last remaining issues and get this merged! I'm curious why was the port developed out-of-tree? I'm asking because I'm afraid it's much more complicated to properly review such a big change, as an port to new architecture is, in a single CL. In any case, please check https://github.com/golang/go/blob/master/CONTRIBUTING.md and the linked from there https://golang.org/doc/contribute.html for more details. @cznic We were under a tight deadline and did not know if it was feasible. This is the earliest I could engage the community. We can break down the change into smaller chunks if necessary. @alexbrainman Thanks for the link. We are committed to meeting the requirements outlined in the doc. We are committed to meeting the requirements outlined in the doc. Enable 'go tool objdump' to disassemble windows/arm images. Enable the Go linker to generate executables for windows/arm. permitted to have fixed base addresses. @hyangah FYI, the test is passing after fixing the time functions. the system performance counter, so has much higher resolution. On ARM, use QueryPerformanceCounter() to get a high resolution timestamp. Change https://golang.org/cl/154761 mentions this issue: Revert "runtime: use QPC for nanotime and time.now on windows/arm"
Revert "runtime: use QPC for nanotime and time.now on windows/arm"
The failing test is TestCallbackPanic(). I'm suspecting stack corruption. I also want to modify cputicks() to call onosstack(_QueryPerformanceCounter, ...), and I want to modify onosstack() to not modify any global data. These routines are called deep in the scheduler and I am concerned they could be corrupting state. Here is the issue with TestCallbackPanic(). // nestedCall calls into Windows, back into Go, and finally to f.
// unwind of g's stack (see comment at top of file). It restores the g0 stack pointer from the value saved on the stack by cgocallback. cgocallback saves m->g0->sched.sp to the stack, which was previously written by cgocall when EnumWindows was called. // Now there's a valid m, and we're running on its m->g0. // Save current m->g0->sched.sp on stack and then set it to SP. // switch back to m->curg stack. // NOTE: unwindm knows that the saved g->sched.sp is at 4(R13) aka savedsp-8(SP). So, the fact that we see FreeLibrary execute with the same stack pointer as EnumWindows seems to be by design. EnumWindows was not allowed to complete since a panic occurred while it was calling back into Go code, and it's stack was deallocated. This shouldn't be an issue, since it is generally an error to maintain references to stack local memory that outlive the stack frame. When the user32 module is unloaded, its garbage collector runs and scans for outstanding resources, which include outgoing calls that have not been completed, and their associated resources. Since the SEH handler never ran (because an explicit call to panic() does not trigger SEH handlers), the global tracking database still has a reference to the bookkeeping information that was stored on the stack. However, this stack space was deallocated, and new code is running over it, which corrupts the data. The bookkeeping code faults when it loads a bad pointer from the stack. As you can see, this error occurs due to very specific interaction between Go's deferral mechanism, Go's callback mechanism, and user32's resource tracking mechanism. In order for C code to be go-panic-safe, it should not allocate any resources, and should not maintain any references to stack memory. In terms of fixes, I'm not sure there's a way to ensure that C code which relies on SEH or C++ exceptions has a chance to clean up in case of a go panic. It seems best to recover() in the callback, and not panic across callback boundaries. Another option is to find a replacement for EnumWindows that is safe to panic across and use that for the test instead. @alexbrainman @ianlancetaylor , what do you think? Any idea why the test passes on x86? What's the key difference? I think it has to do with how subsequent code overwrites the stack. If the data structure on the stack doesn't get overwritten, the error will not manifest. amd64 and x86 have the same underlying issue, but they must not corrupt the bookkeeping datastructure. I'm not sure there's a way to ensure that C code which relies on SEH or C++ exceptions has a chance to clean up in case of a go panic. I agree. This is not implemented, and it won't be simple to implement. It seems best to recover() in the callback, and not panic across callback boundaries. I agree in general, but I don't think it is acceptable for our runtime tests. I think Go users write code that panics from callback and into call site function. We should try and make it work, if possible. That sounds good. 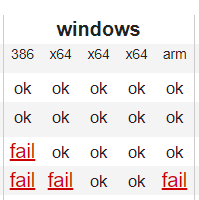 I don't remember who came up with EnumWindows to test it all, but anything else should be fine too. As long as it works and easily available on any Windows computer that is supported by Go. @ianlancetaylor One of the reasons it doesn't readily manifest on amd64/386 is that amd64/386 tests run on Windows Desktop, which has a different implementation of user32 than IoT Core, which is where the ARM tests run. Iot Core uses 'minuser', which is a completely rewritten window manager. I was able to reproduce the exact crash on AMD64 by running the test on IoT Core. In the deferral, I called a function that used a large chunk of g0 stack (in a legal way), to ensure that any stack based data structures still referenced would be overwritten with garbage data. Later, when the user32 garbage collector crashed, it crashed in exactly the same place as ARM, because the stack-based bookkeeping structure had been overwritten in the deferral. On ARM, to further confirm that stack corruption was the issue, I inserted code in callbackasm1 to save the current g0 SP so that when unwindm restores the g0 SP, it will restore it to a value that is safely below the stack for EnumWindows. With this change, the crash went away because EnumWindow's stack was no longer being overwritten in the deferral. The test ran many times successfully. Given these findings I have increased confidence that this is the issue. unwinding mechanism. See the associated issue for more information. @jordanrh1 Is there an issue for porting to Windows/ARM64 too? Thanks. It seems exes built with GOOS=windows GOARCH=arm with the current master won't run on Windows RT 8.1, failing with "This app can't run on your PC". This is with code signature checking subverted. I haven't looked into it yet so I'm unsure of details and I know this platform is out of support, but is this a configuration that theoretically should be working? By the way, fantastic work. You also need to specify GOARM=7. I'll look into whether there's a way to do this by default. Unfortunately it's still failing with the same error. I made sure to clear the Go build cache and delete the output .exe, so I'm fairly sure it is getting rebuilt properly. I've put my test file / command below. Then try running the program. Loader spew will be printed to the windbg window. I definitely have time to do some tests and try to fix this, but likewise, don't worry about this platform too much if nobody considers it important! Unfortunately it appears security restrictions in Windows RT prevent the debugger from creating or attaching to processes. If you know of any other way to get log messages out of the linker / loader I'll happily try that, otherwise I'll reply later if I end up getting the debugger working somehow. @jordanrh1 I managed to run windows-arm on one of my RPIs. The only bits I am still missing is git command. What do you do for git on windows-arm? @bradfitz is there a git command that is written in pure Go? I would just compile it to windows-arm and use it there. I would not need anything fancy, just basic git functionality. @alexbrainman, the builders don't use git. They only run the x/build/cmd/buildlet binary and the cmd/coordinator pushes code in tarballs at them. @alexbrainman, the builders don't use git. Fair enough. I suppose I have to find a way to develop on this thing. I do all my development on linux and cross compile to windows/arm. But I was trying to fix #30711. And that involved running cmd/go.TestScript, and cmd/go.TestScript runs go.exe executable. So I needed all moving parts. I used $GOROOT/src/bootstrap.bash (luckily for me it worked without a hitch) to create a snapshot of current Go tree with executables and built packages, and copied all these files onto RPI. And then run the test. I did not have Git, so I had to be careful when changing files to fix #30711. The fix was small enough for me to manage without Git. But I would not use that setup for anything bigger than that. RPI runs standard Windows file and printer sharing services, and I was able to mount shares from RPI on my Windows PC. Maybe (I did not try that) I could just use Git on my Windows PC to manage Go repo installed on RPI. I will see next time I use that. Another thing. While debugging, I searched for windows-arm prebuilt image on https://golang.org/dl and it is not there. @bradfitz maybe we should put latest windows-arm image at https://golang.org/dl. I doubt there is need for ,msi file, but we should put .zip file alongside with 386 and amd64. Also @jordanrh1 I struggled to make Windows 10 running on some of my RPIs. I have RPI 3 B+. I downloaded "IoT Dashboard", and it gives me option of installing "Windows 10 IoT Core (17763)". I created SD card (ScanDisk Ultra 16GB), but RPI does not boot - red power light comes on, and I get rainbow image on my HDMI screen, but nothing happens. I also have RPI 2 B. I tried booting this with the same image - red light is on, green light flashes 4 slow times followed by 4 quick times, same rainbow image on the screen. I managed to run Windows on RPI 3 B. But I would like to make my other RPIs run Windows. Do you have any suggestions? Also I noticed that windows-arm builder is not listed on https://build.golang.org Can you, please, investigate what happened to it? I also wonder, if we could run windows-arm build on multiple RPI devices to make it faster?